Standing outside a makeshift shelter in Tijuana, Nolvia Dionisia Romero said it took nearly a month to travel from her home in Honduras to the U.S.-Mexico border in a caravan with thousands of other Central American migrants. “I came because of death threats,” said Romero, 39, in Spanish. She said her goal is to seek asylum in the United States and try to reunite with her sister in Minnesota. A gang member killed her nephew, she said, and demanded Romero pay a weekly “protection fee,” about $61 dollars, or lose her own life. She scraped together the money for months, until she couldn’t pay anymore. Romero said she had no idea of what would happen to her once she asked U.S. border officials for asylum. “No, I don’t know anything about that,” she said. Romero added that she initially believed she’d be able to cross the U.S. border quickly, but had been waiting in Tijuana for weeks, surviving on donations. Like Romero, most asylum seekers don’t know much about the U.S. immigration system or efforts by the Trump administration to restrict asylum benefits, attorneys say. And a new federal policy announced Thursday could further complicate the situation by pushing asylum seekers back across the border to wait in Mexico while their asylum claims are decided in the U.S., a process which can take months or years. The U.S. Department of Homeland Security said in a statement the policy change aims to reduce “false” asylum claims, and combat the “overwhelming” backlog of more than 786,000 pending cases in immigration courts nationwide. Homeland Security Secretary Kirstjen Nielsen and other officials in the Trump administration maintain that the asylum system is being exploited by migrants solely seeking economic opportunity. said Nielsen in the statement. A report this year by the American Immigration Council shows 96 percent of non-detained families applying for asylum show up for all their court hearings. The new asylum protocol was almost immediately criticized by lawmakers and immigrant advocates. After Nielsen announced the new policy at a House Judiciary Committee hearing, San Jose Rep. Zoe Lofgren, who sits on the committee, told the Homeland Security Secretary legal challenges would ensue. "You'll be seen in court,” said Lofgren, an immigration attorney. “Your policy does not adhere to the requirements of the immigration law. If it does, the rest of the immigration law might as well not be written." Asylum rules have never been simple. But they’ve been shifting rapidly in recent months, as the Trump administration issues new restrictions and immigrant advocates sue. On Wednesday, a federal judge in San Francisco temporarily blocked the Trump administration from enforcing another recent policy that sought to disqualify asylum seekers who entered the country illegally between official ports of entry. Also Wednesday, a federal judge in Washington, D.C. overturned a Justice Department ruling from June that had made it harder for people fleeing gang and domestic violence to win asylum. The federal government is expected to appeal both rulings. Immigrant advocates decried the new policy of forcing people to wait in Mexico as another way to unlawfully restrict asylum applicants and further imperil their safety. Many Mexican border cities are among the most violent in the country. Tijuana, where Nolvia Dionisia Romero and thousands of Central American migrants are encamped, is Mexico’s most violent city, with 1,618 homicide cases in 2017, according to official statistics. As migrants from the caravan are now waiting in Tijuana, unable to cross to the U.S., some are beginning to realize how difficult the asylum process could be. Immigration attorney Lisa Knox said it’s common for migrants like Romero to flee persecution and violence in their home countries without much knowledge of the U.S. immigration laws. “They have no choice, right? Like, they're fleeing for their lives and so they're not are not stopping to get information,” said Knox, who works at Centro Legal de la Raza in Oakland. Until Thursday’s announcement, the Trump administration had pursued a policy of keeping more asylum applicants detained in immigration jails while their claims are adjudicated. Knox said many of her clients didn’t realize they would be locked up for months by Immigration and Customs Enforcement, or separated from relatives when they requested asylum at the border. Earlier this month, Knox traveled to Tijuana with other volunteer attorneys to provide legal orientations about the asylum process and the rights of migrants, so people like Romero could make a more informed decision on whether to present their claims to U.S. Customs and Border Protection officials. “A lot of these folks do have good claims but without knowing the law and without having attorneys they may not be able to put those forward,” said Knox. Only one in 10 applicants without a lawyer won asylum in 2017, compared to half of those who had a lawyer, according to government figures compiled by researchers at Syracuse University. In its announcement Thursday, the Department of Homeland Security issued no details on how asylum seekers, who often lack money and resources, will be able to attend hearings in U.S. immigration courts, or find U.S. immigration attorneys, if they are unable to come into this country. While DHS said asylum applicants will be given a “notice to appear” for court hearings, it’s unclear how those documents will be delivered, when migrants lack a stable place to live. The DHS did not immediately respond to a request for more information. In Tijuana, dozens of U.S. legal workers have volunteered each week since the largest caravan arrived in the city last month. An additional 500 paralegals, law students and attorneys have signed up to provide pro bono services in the coming weeks, said Katharine Gordon, a coordinator with the nonprofit legal aid group Al Otro Lado. “The outpouring has been unlike anything I’ve ever seen,” she said. 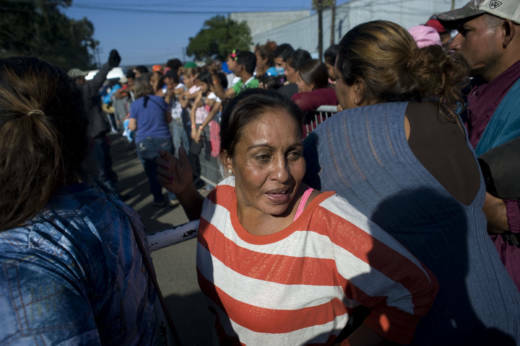 Nolvia Dionisia Romero, the Honduran woman who traveled to Tijuana to request asylum, said she is very interested in consulting with a U.S. attorney about her prospects. But as she waited in the backlog of asylum hopefuls in Tijuana, she had a more urgent priority: finding work, so she can survive the potentially months-long stay in Mexico. Polly Stryker and Ted Goldberg contributed to this report.